I have visited Ars about five times and during the time span of my visits I have seen some changes there. One of the most significant changes concerns St. Philomena. When I first went it was rumoured that the shrine of St. Philomena in the church was to be dismantled and replaced with a shrine connected with the Passion of Christ. I was with someone who had taken a serious personal interest in keeping Philomena in Ars. I know others protested to the parish priest and to the Benedictine sisters there. There were other voices raised elsewhere in favour of the saint (Mark Miravalle for example). I also met the writer Courtney Bartholomew one evening in Ars. He was passing through and had the same concern. Eventually questions were asked at the Vatican. A pamphlet was produced with the approval of the local Bishop giving the official response of the Vatican to the question of veneration of St. Philomena. Basically it is that we are always allowed to have a personal devotion to her, but that there are no longer any public liturgical prayers etc connected with her. Some (e.g. in The Catholic Herald) had said that there is no evidence of her existence. This is not true. The problems that occurred over the relics and the tiles found in the catacomb can easily be resolved. During the last Holy Year, Pope John Paul 11 asked one of the Cardinals to go to Mugnano (the official Shrine of St. Philomena) to bless the doors of the church, thus connecting them with the Holy Year indulgence. One of the results of this controversy is that the shrine of St. Philomena remains intact. St. John Vianney wanted to give credit for miraculous cures etc to his favourite saint. Some writers tried to explain this away as an expression of his humility, but they never dealt with the fact that they were suggesting that he deliberately lied. This he did not do. He genuinely believed in her intercession. I would like to say more about St. Philomena in another post. The Basilica was restored and repainted during those years. It is a fascinating building, and pilgrims need to know that one of the dedications is precisely to St. Philomena. The liturgy is greatly enhanced by the music of the Benedictine sisters (out of the community of Sacre Coer in Paris) and one of the delights of Ars is attendance at the sung Divine Office. The body of the Cure is incorrupt (almost naturally mummified). There is a wax covering on the face. It is amazing to see how little he was. Even allowing for the shrinkage of the body, he was very small. There is not space here to go into detail about his life (and, in any case, that can easily be found elsewhere on the net) but I remember especially two stories found in the great biography by Abbe Trochu. One took place when he was a curate under Mgr. Bialle. A parishioner had given Vianney a pair of new trousers (he was in great need of them!). The first time he wore them he returned to the presbytery wearing a pair of worn corduroy-like trousers. It turned out that he had run across someone who needed the new trousers more than he did, and they exchanged! There is a similar story concerning shoes. The sisters who ran the orphanage he built near the church at Ars (La Providence) bought the Cure some new shoes. He met someone else who needed them more and came back shoeless! To avoid hurting the feelings of the sisters he walked in such a way that the hem of his cassock covered his feet. Of course he was found out. That's why we have the story. Pope John Paul 11 suggested that St. Jean Vianney is a model for today's priests. Some criticised this idea, but perhaps they were worried in case they were being asked to exist on a diet of mouldy potatoes or to spend all night in prayer. 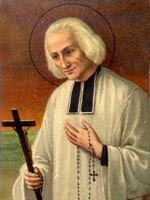 St. Jean Vianney did not expect all priests to do what he did. In fact, speaking about his severe mortifications he called them his "youthful indiscretions". Some priests will ask how we can possibly emulate a saint like this, but we are not being asked to take on severe mortifications. In any case that kind of thing should not be taken up without the permission of a sound spiritual director. We might ask ourselves, however, about our own life-style and whether or not we might do more in the way of penance now and again, be less materialistic, more generous in our pastoral work or more devoted in our prayers.